Hi everyone! Thankyou for taking part last week This week's theme is a recipe: on your card you must add the following '1 ribbbon, 1 flower, 2 buttons and some glitter'. You can do what ever else you want on your work as long as these things are used. We've come up with a few ideas for you, which we hope you enjoy. Congratulations to sumbine you have won last week's prize - a nature embossing stencil, please email us at mytimetocraftchallenge@hotmail.co.uk and we will pop this in the post for you. 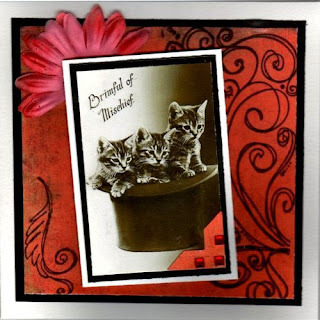 For my card I have used an image from the Artful Stamper. I have added two buttons to the wheels of the pram. 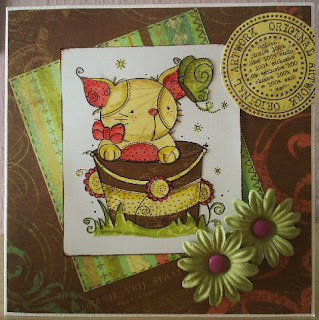 The patterned paper is Papermania and to this I have added some Cuttlebug Swiss Dots embossing, embellished with knotted satin ribbon. The image has been coloured with Sakura Stardust pens for the glitter part of the recipe and I have also added a couple of pink sparkling gems. My flower was popped into the top corner. I stamped AJ and Lulu and coloured them with Pro Markers and gave them glittery wings. I added some Papermania ribbon and buttons and a Prima flower. 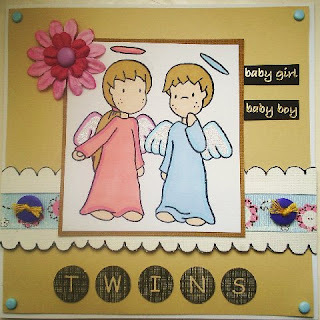 I stamped the 'twins' sentiment and cut the scalloped edge freehand. 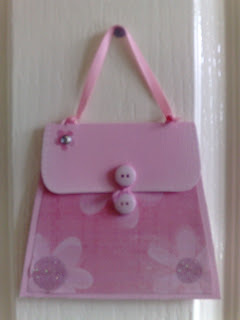 Out of pink card I made a purse shape, covered the front with patterned paper and glittered the flower centres. I added a ribbon handle and 2 buttons as a closure. I embellished the flap with a paper flower with a gem in the centre and added a stitched effect around the edge with white gel pen. 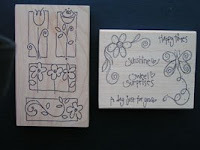 For this recipe I have used one of Linda Luckin's new daisy design stamps. I stamped it in black versafine then coloured it in with watercolour pencils and added dazzling diamonds from stampin' up to the middle! Two small buttons stitched to the top. Finished with a bit of ribbon and a paper flower. 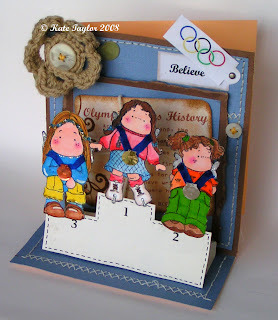 This week I made an Olympic Games themed card. I watercoloured 3 tilda images, giving each one a medal, using 1 ribbon chopped into 3. I used some shiny gold, silver and bronze paper for the medals. I made a podium, using rub-ons for the 1st, 2nd and 3rd place. I added one flower, some glitter, 2 buttons, some stitching and a crochet flower. I printed out some words about the Olympic Games' history and distressed with inks. I printed out the Olympic rings added a brad to reveal the word 'believe'. I thought I had to make something to celebrate the Olympics. I think Tilda's proud shes won something!!! 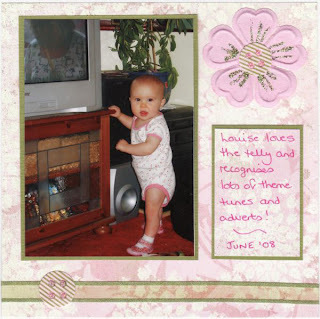 I have used paper from the Basic Grey Sugared Collection for the background and matted a photo of Louise on. 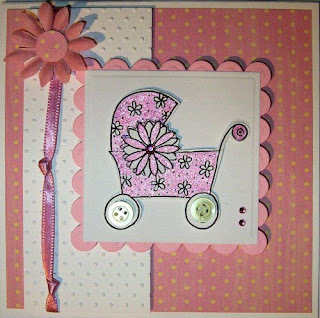 I added a ribbon, 2 buttons also from the BG Collection, a paper flower and some journalling. I have used Stickles for the holes in the buttons and on the flower for a glittery effect. Hi everyone! 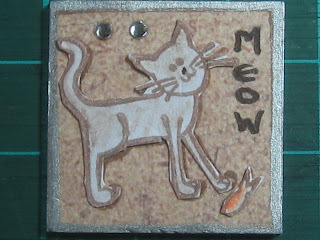 Thankyou for taking part last week This week's theme is 'Cats' Use cat rubberstamps, your pet photos, stickers anything you can think of. Our design team has been busy and made a few ideas for you below. Congratulations to Alison you have won last weeks prize -2 rubber stamps by Printworks please email us at mytimetocraftchallenge@hotmail.co.uk and we will pop those in the post for you. This week's Prize, supplied by Fat Freddie's Craft Shed - is a nature embossing stencil Everyone who takes part in this week's challenge by (Monday the 18th of August 10pm GMT) will be entered into a prize draw and one lucky person's name will be picked at random winning our prize! 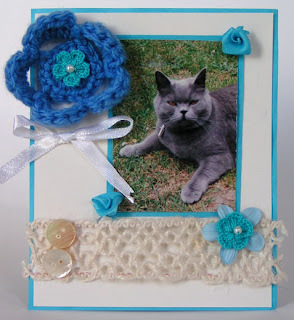 This weeks challenge is dedicated to Kate's cat Poppy who passed away today. I stamped a cat image and water coloured it in, then matted it onto plain and patterened papers. I added a circular message and some flowers to finish it off. For my card I have used an image from a Tuscan Rose CD. This has been layered and mounted onto a background of Basic Grey paper that has been grunged up a little and stamped with Autumn Leaves Flourish stamps. Embellished with a photo corner, gems and a silk flower that has been folded and tucked under the corner of the topper. I paper pieced my cat with K & Co papers and defined areas with distress inks. 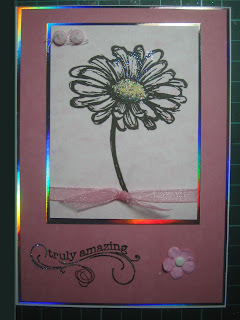 I used matching K & Co papers for the background and added some Prima flowers for decoration. Hi everyone! Thankyou for taking part last week, looks like you really enjoyed the challenge. 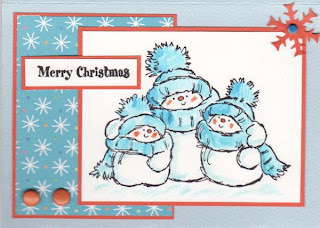 This week's theme is 'Christmas' (this is the perfect chance for you to be early and make a christmas card!). Of course you can make anything else christmasy, including ATC's, tags etc. Our design team have come up with a few ideas for you and we hope you have a great time taking part in our challenge. Congratulations to Val dulac you have won last weeks prize please email us and we will get it in the post for you. I stamped a Penny Black snowmen image and water coloured it in, and matted onto patterned and plain papers to co-ordinate. I punched a snowflake in orange, added some brads, and stamped a message to finish it off. 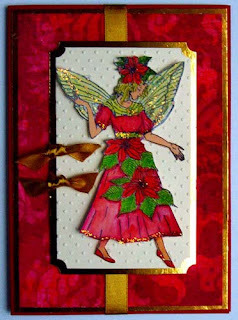 For this week's card I have used backing paper from the Artylicious Seasons Greetings CD along with a stamped image of the *Poinsettia Fairy* from *Joanna Sheen. *The image has been water coloured and mounted over a cuttlebug swiss dots background piece. I have added glitter to the Fairy in places and embellished with Gold Satin Ribbon. 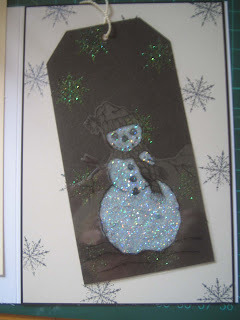 For this weeks challenge I used a Linda Luckin snowman stamp stamped with black stazon on to acetate. The I used art institute white glitter to cover his body - I cut him out to stick him onto the tag.. The tag has been stamped with Linda Luckin snowflake and embossed with glittery embossing powder. The background paper was then stamped the same snowflake stamp. I stamped a Christmas scene and coloured it with watercolours and added some sparkly glitter. 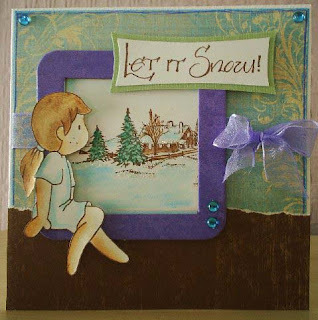 I also stamped and coloured Lulu and placed her on a chipboard frame which I placed over the Christmas scene. I then added a greeting, ribbon and gems for decoration. I covered the base card with two co-ordinating pieces of paper and hid the join with a piece of ribbon. 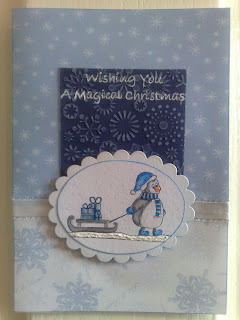 I cut a rectangle of blue card, embossed it with the snowflake CB embossing folder, then sanded over the top. I stamped the message at the top in white ink. I stamped the penguin image and coloured him with Prisma pencils and added some faux snow and a bit of glitter, then cut around it in an oval shape, inked the edges in blue then mounted this on to a scalloped oval, then assembled all the pieces to the base card. I watercoloured my Tilda image and used various scraps of paper for my background. I stitched all around the edges of my card. I added loads of buttons, paper flowers, string and gems and a bright green ribbon.